La Mercè is all about traditions first. Therefore, discover different shows in the Gothic Quarter mainly, with castellers, falcons, correfocs and also traditional dance, like Sardana. Friday 21: 7pm: Opening dance (sardana) on the Avinguda Catedral and then at 7.45pm, official start of the festivities with the Gegants Nous (New Giants) parade. 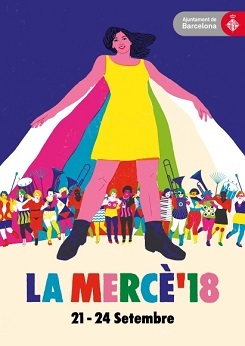 Saturday 22: 10.30am, dance and parade, starting from Plaça Sant Jaume and circling around to the Catedral of Barcelona. This will be follow by traditional dances all afternoon (until 6pm). For the bravest, at 6.30, on the Via Laietana, the young dragons with their fireworks will parade. Just make sure to wear long sleeves to avoid getting burnt and let’s enjoy! Sunday 23: you can see different parades and dancing on that day. 10.30am is the parade of the Falcons of Barcelona and Vilanova, 11.00am, the 68th dancing competition (Sardana) on the Catedral avenue and don’t miss the Giants’ parade at 9pm, starting from the portal Santa Mardona. From Saturday until Monday, you can pack you picnic and go to the river Besòs! Once you’ll be there, different activities can be done (starting from 12am). Discover circus company or participate to a dance class with the all family. There is entertainment all afternoon, so just pick the one that suits you best! To go there, just take the subway to Bon Pastor (L9N or L10N) or the bus to Arbeca-Lima (line 11 or H4). Once here, just cross the bridge and enjoy! If you want to enjoy a beautiful view and monument and celebrate La Mercè at the same time, you are in the right place! Discover different circus show and concert, from noon until 8pm. Different circus companies from Europe come here to perform some amazing shows. To go there: go to Paral-lel station (L2 or L3) and then take the funicular of Montjuic to the top. You can also reach Plaça Espanya and take the bus 150 to the top (need to walk a bit more though). You will find different areas there, divided between the parc and the Passeig de Lluís Companys. Theatre and puppet performances are planned all afternoon. You will also find some dance show and concert on the Passeig de Lluís Companys (Arc de Triumph). Come back during the evening to see illuminations on the different venues. To go there, go to Arc de Triomf, by the subway (L1) or by bus (H16, 19, 39, 55). This weekend in Barcelona, you will find different venues and celebrations all over the city. A great way to discover the different monuments that Barcelona has to offer and a typical Spanish celebration. Check out the full program here. Enjoy your stay in our hotel for family in Gracia.